The commonly referred to trinity in drinking circles is the so called French trinity of spirits: calvados, cognac, and armagnac. Then there is the much more vague trinity that encompasses essentially the entire range of options at a bar: the cocktails, the wine, and the beer. Most cities have a real strength in one of these categories, be it New York’s dozens of craft cocktail bars, or San Diego’s shocking number of craft breweries, or San Francisco’s caliber of wine thanks to Napa and Sonoma just up the road. It is truly startling when happy hour arrives each day in Portland and the immense number of options are set before you once again. Portland happens to be the most microbrewery rich city in the United States with upwards of 40 of them. The Rose City happens to be an hour away from Pinot noir nirvana and one of the world’s premier wine growing regions, the Willamette Valley. The trinity is truly complete in this city. Craft cocktail bars are sprouting up everywhere now like the roses in the Test Garden in Washington Park. I didn’t sample a single cocktail that wasn’t spectacular until the very last bar. It was a streak nearly as impressive as Cal Ripkin’s consecutive games streak. Any cocktail tour of Portland must start where the whole movement started in 2007, at Clyde Common, the urban, European “tavern” that started, or at least is credited, with giving steam to the barrel aged cocktail movement (a good movement) and the communal table (a trend that must end)/no reservations/come as you are this is a public tavern with high end food trend. Located adjacent to the lobby of the Ace Hotel, also home to a Stumptown Coffee, Kenny and Zuke’s Deli, and a lobby that looks more like a hostel’s lobby but guests pay over $200 a night, you are just as likely to see a dashing supermodel as a jetlagged tourist lugging their baggage from the lobby to their communal table. It’s a loud, bustling joint. Chic and full of a glossy, glassed in feel, Clyde Common remains one of the ground breakers in mixing high end cocktails with high end cuisine. Really, though, it is only an absolutely essential stop for cocktail purposes. The beverages come courtesy of Jeffrey Morgenthaler, a nationally renowned voice on everything cocktail. Perhaps today is a refreshing day for the Fool’s Gold, mixing cachaça, Lillet Blanc, lime, tarragon, and Galliano, or to get the night revved up, go for a Sore Loser of bourbon, crème de pêche, dry sherry, Pontarlier anis, bitters, and orange peel. The drink you must have is one of the classics of America’s cocktail cannon: the Negroni with Beefeater gin and Cinzano sweet vermouth, aged two months in Tuthilltown Whiskey barrels to achieve a taste as crisp as autumn, smooth as Fred Astaire. Extra credit goes to Clyde Common’s bartenders who despite their impressive menu and world class mixology talent, would still be willing to make a mojito or cosmopolitan if you wish. It’s the amateurs who don’t do that they claim. They’re right. But you’re here for the real deal. 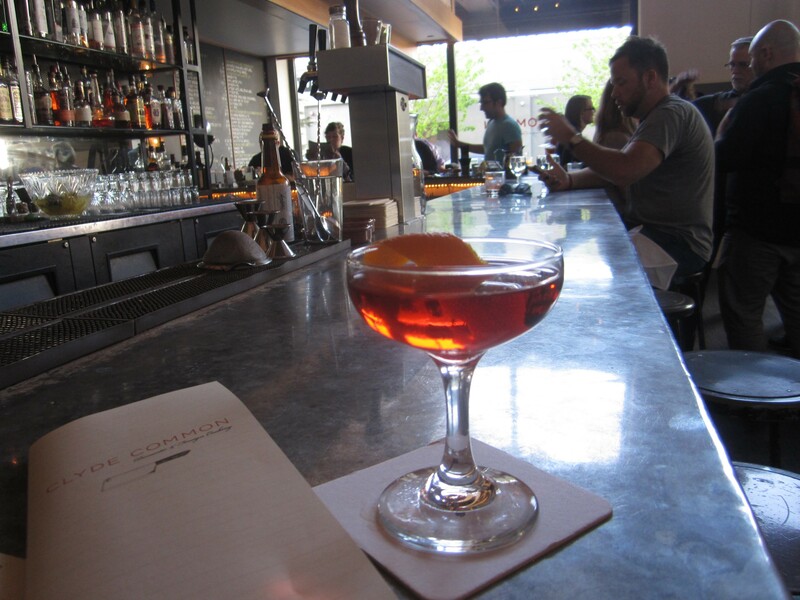 Get the Barrel Aged Negroni then continue with the creative choices. Nobody can complain about the immense number of excellent places to eat in Portland. 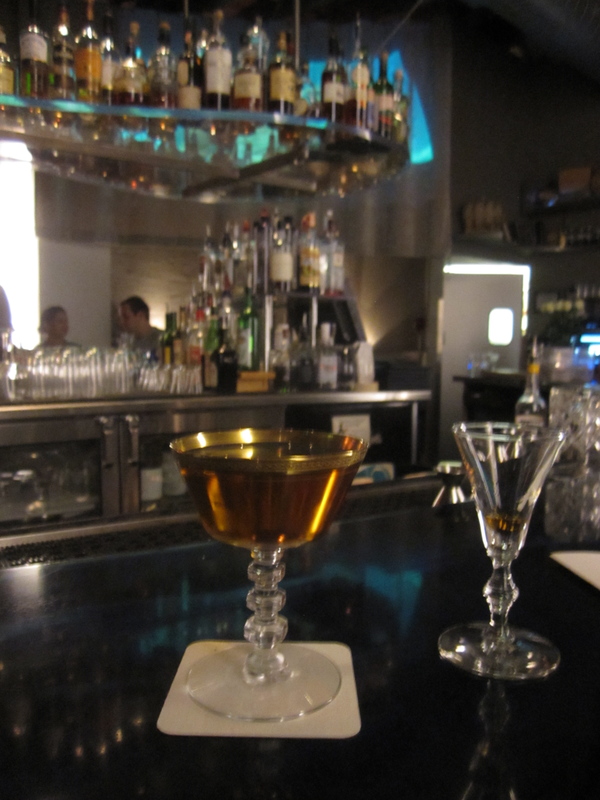 However, it is a problem when two of the leading cocktail bars happen to also be outstanding restaurants too. Then comes the dilemma: cocktails and dinner in one full swoop, or try to hit two spots? It is easy to go to two cocktails bars. Two dinners is another story. Like Clyde Common, Beaker and Flask, in the Southeast, has an open kitchen crafting dishes from an exciting menu, but the real pièce de resistance lies at the room long curved bar. 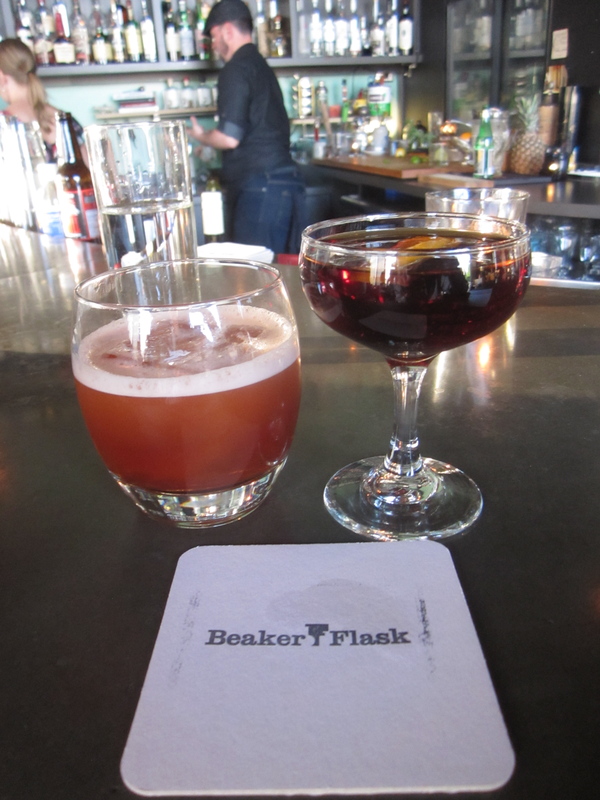 With your black tea fried chicken, the stiff but balanced Louisville Slugger would be perfect, with bourbon mingling with bitter cynar, ramazotti amaro, and benedictine. It’s a unique, more tart Manhattan. Most intriguing would be either the Walk in the Woods balancing Old Tom gin, sage syrup, egg white, and yes, stone pine liqueur, or Sal’s Minion with good aged rum (yes, not the bad stuff), pineapple gomme, and ice cubes crafted from coconut water, a brilliant flavor idea and watered down drinks solution. Next time I’ll certainly have to try the End of Days mixing pisco and mezcal, along side cocchi americano, yellow chartreuse, and grapefruit bitters. Bartenders here are like what a doctor should be: you always have faith in them, they’re always consummate professionals, and they know when to joke or when to look you in the eye and talk serious business. Everything on the list is a winner, but I just don’t know if I could return and not again order the excellent rye, apricot, benedictine, and bitters cocktails known as the New Vieux. It’s a new classic that will soon be a vieux classic. The postage stamp sized Kask in the West End of Downtown is owned by Grüner, the exceptional Alpine European restaurant next door that serves arguably America’s premier burger alongside spruced up choucroute and spaetzle. 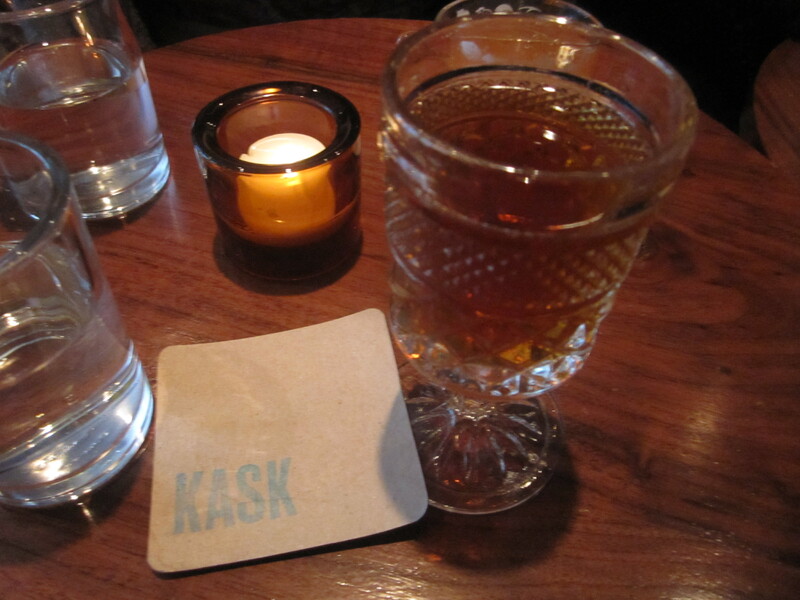 Kask has nothing to do with Grüner’s cuisine. The Rabo de Galo leans towards Rio instead of Vienna, with a samba and coffee effect on the Manhattan, blending Brazilian coffee bitters with sweet vermouth, gran classico bitters, and Novo Fogo barrel aged cachaça. The Bootstrap Buck is no basic dark and stormy, with a sensual depth to the Cruzan Blackstrap rum, ginger beer, demerara sugar, and hefty dose of nutmeg. Do consider two unlikely options here as well. Tommy Klus the mixologist here makes a $5 daily punch that makes every other punch in this world truly seem like Kool-Aid. This is no prom punch bowl. Best is a drink known as Heaven’s Kickback, sweet from St. Germain liqueur, a bit boozy from encanto pisco, tangy from honey and grapefruit, then brilliant thanks…to celery bitters. Celery never tasted so good. 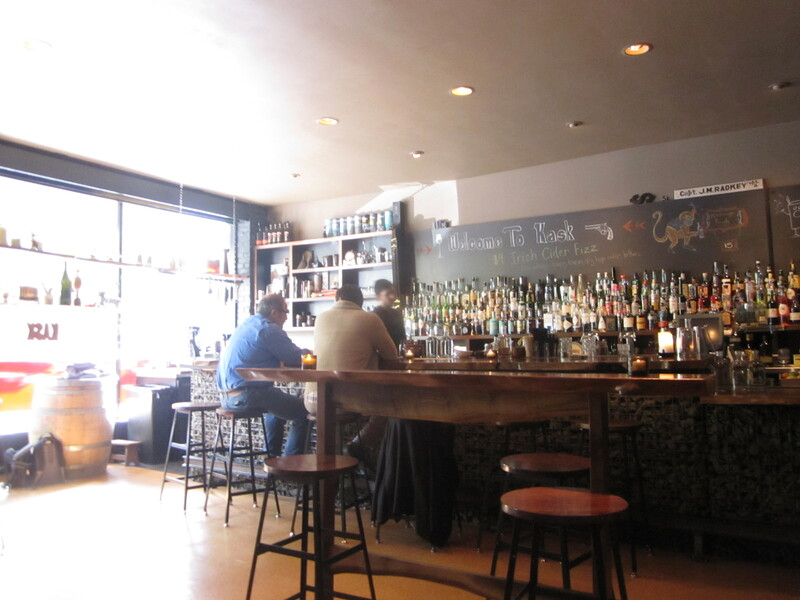 Kask feels a bit like an Alice in Wonderland bar with its low tables and stools in the corner, then the handsome bar and high two top tables across the room. Space is very limited so some right at 5 pm to have some peace in this wonderland of exquisite cocktails. No Grüner food is available except for some of their charcuterie and charcuterie from Olympic Provisions also is on offer. 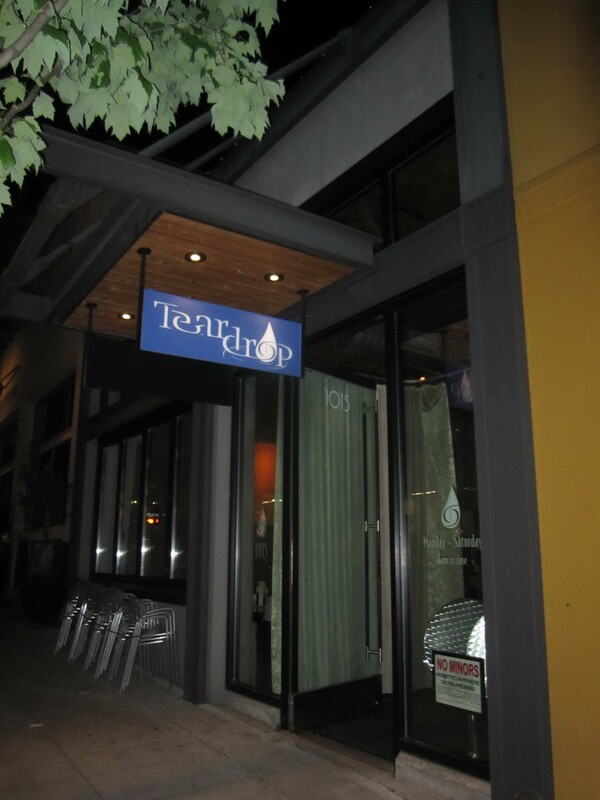 Teardrop in the gentrified, loft and yoga Pearl District, fits right in with its SoHo boutique atmosphere. The scene may overwhelm you at first, but this is a Harvard level serious cocktail den where the masters in the center of the horseshoe bar know their way to crafting an old school Morning Glory Fizz from the Savoy Cocktail Book or the new, gin, rose, and Fernet Branca drink White Flag. A visit requires at least one Wanderlust, served up in a regal gold rimmed glass, quite possibly the supreme cocktail of Portland. As the menu states, it is truly a languorous journey through exotic spices and bold aromas. The magic carpet ride starts with Banks rum, a smoothness from a house sherry blend, a touch of chamomile grappa, orange bitters, a very distinct medjool date bitters dash, then served up in a glass kissed with the flame of absinthe. Breathtaking. 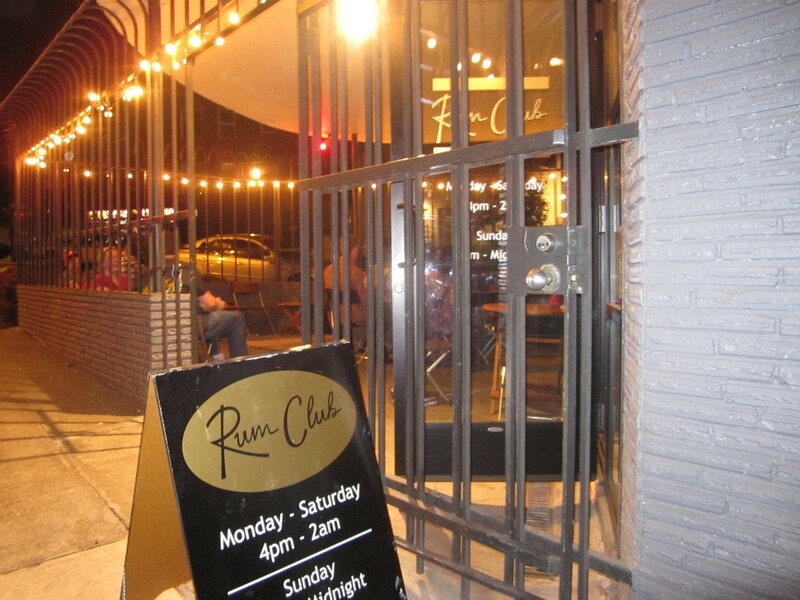 I do have to say the consecutive cocktails streak ended at Rum Club, the second bar from Beaker and Flask right next door to the original that is not even close to the mothership in quality or atmosphere. Each drink was imbalanced in some form- the Rum Club Daiquiri far too sweet, the Begonia with too much vermouth covering up the cachaça and velvet falernum. If you’re really into rum at the Rum Club, don’t hesitate with the Rum Club Old Fashioned. The Rum Club just doesn’t feel as welcoming as Beaker and Flask and the design is very plain black. If you expect a tiki bar, this isn’t it with the decor or the menu. It’s got tremendous potential to be a leading rum themed bar. Rum Club just isn’t there yet. Finally, Pok Pok and St. Jack are essential stops for dinner that most people don’t think of with cocktails (unlike Clyde Common and Beaker and Flask). Pok Pok’s drinking vinegar creatively mixed with spirits are some of Portland’s drinking highlights, also available across the street at the sister Whiskey Soda Lounge. St. Jack’s bartenders crafts some beauties too, especially the elegant Manhattan riff called the Baccarat, enhanced by orange bitters, maraschino liqueur, and aperol. Or go for the real eye opener where pastis meets mojito in the French Pearl. They’ve got the trinity in Portland, for sure. Barrel Aged Negronis or celery bitter based cocktails, all that tremendous food, wine, and beer has led to a very special cocktail scene. This entry was posted on May 23, 2012 by trevsbistro. It was filed under Insight, Portland . Love all of these cocktails bars…great article.